This is the deepest Recruiting class I’ve seen in my sixteen years of covering high school recruiting with the magazine, and the deepest I’ve seen for one season in my twenty-two overall years in the business. I ranked the players based on what I saw from watching tons of film and in person over a two year period, and with some kids a three year period, of scouting. I look at most upside and most ready for the DI level, and I don’t look at other lists, nor do I get influenced by who makes All Star games or All State. Most of my selections are also based on kids who are most ready to play at a high caliber school as a true freshman. You see many Athletes and lineman in my top 25. Athletes are kids who can play three or four positions in college and do well at all four at a high caliber. I saw all of the high school teams either in person or filmed each at least two or as many as six times before making a final grade. This list is strictly seniors and kids who are no brainer DIV 1 for college. There are another 85 to 90 players I did not list that will make great IAA recruits and be great players for their programs which is why I did the Heart of Champions list. Later this week I will have my Sleeper list of players that did not get mentioned in this list. It was hard picking who would be the #1 player in this deep class. It came down too who is the toughest player in the state pound for pound, most polished at his position, the biggest leader, and could be a NFL player for more than one position and in college. His name is Jarvis Landry (6-0, 195) from Lutcher High School. This kid could make All American at either WR or SS in college. He was the best hitter in the state, has the best hands for a WR, is the toughest player in Louisiana, and a big time leader. I’ve never seen a WR in high school play the position like a linebacker. When he has the ball he’s not fun to bring down, and he knows how to use the stiff arm, and loves to KO players blocking, if not catching the football. Two players would have been in the top four on this list, but they will have to start their careers at either a Junior College or Prep School. Ladies and Gentleman, DT Donald Pennington from Amite looks like a more athletic version of Jerrell Powe, the big time DT from Ole Miss, at 6-2 310, with great feet and arms, and a motor. This kid would have been ranked right behind Anthony Johnson from O.P. Walker at #3 overall. WR D’haquille Williams (6-3, 195) from East St. John, like Jarvis Landry, has a future in the NFL as a WR or FS. This kid would have been ranked # 4 in the state overall. Williams looks better than most of the Wide Receivers in big time college football right now. Some smart school will place them in a Junior College or Prep School, stay in touch and re-sign them in either one or two years and have program changers right away if they do so. These two kids are franchise tag players if there’s such a thing for college. You hear the word for the NFL, but they fit the part for college. Some kids slipped in the ranking because of status, like RB Jeremy Hill from Redemptorist (6-1, 225), and it’s unknown if he will sign signing day or not. Two big time players missed the season; namely, DT Quentin Thomas from Breaux Bridge (6-3, 265) and CB T.K. Fleming from Benton High School (6-2, 210). Quentin looks the part in person and 2010 was his year to be ranked high. He’s going to LSU and has huge upside. CB T.K. Fleming is the biggest CB I’ve ever seen come out of Louisiana and the most gifted. T.K. would have been ranked # 5 in the state overall. This kid is a freak in man coverage and at 210 pounds looks more like a Patrick Peterson of LSU in size and speed. The running back position is the strongest and deepest I’ve ever seen in twenty-two years for one season. If you need a great running back then this is the year to sign a ton of sleepers. The weakest position for Division I was the linebacker position, but there’s a few sleepers that will be quality players. 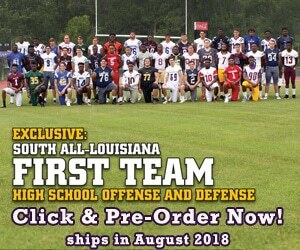 The top nine players in Louisiana this year would be ranked the number one player in most states. That’s how good this class is.